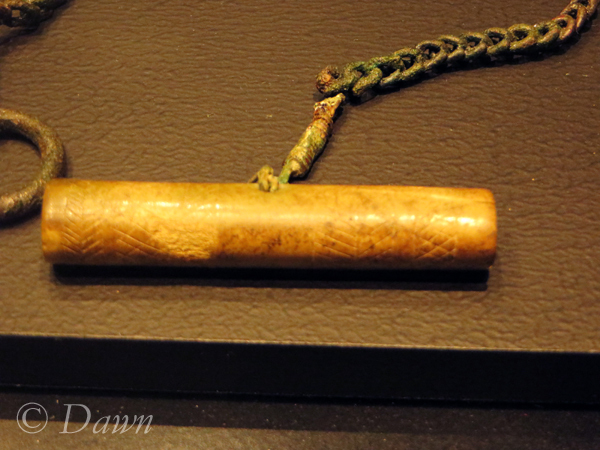 In a previous post I showed off a needle case and needles that were part of the needle coiling display at the Iceland National Museum in Reykjavik. Since I’m showing off a lot of my photos thematically (rather than in the order they were in at the museum) I wanted to take this time to look at a few of the other needle cases (and the displays that accompanied them). Like the one with the needle coiling display, I was surprised to see how small the needle cases were. 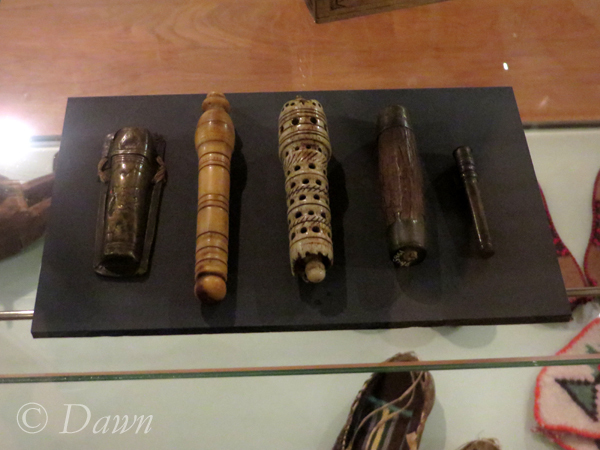 In the upstairs museum exhibit in the National Museum there were also some examples of 18th and 19th Century needle cases which had a much larger range of sizes – from a very tiny, relatively plain example shown on the far right to the very elaborate, much larger one shown below in the middle. 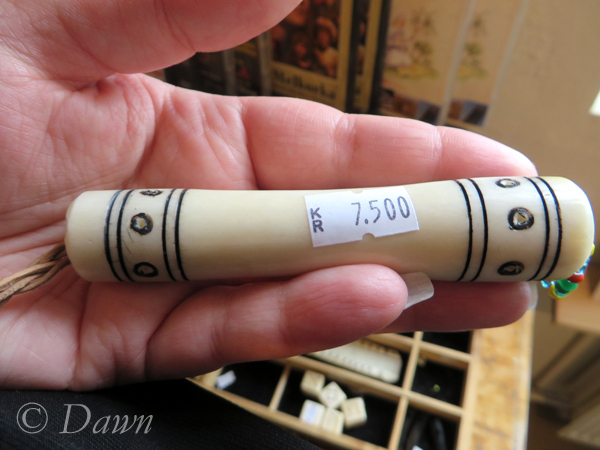 Another needle case I saw was at the Saga Museum – but in their gift shop. This was significantly larger than the finds displayed at the other museum, and with that in mind (not to mention the 7,500kr (approximately $75.00 Canadian) price tag, I opted not to add one of these to my little growing kit of Viking Age costume accessories. I haven’t shared much yet from my August 2014 trip to Victoria, BC, since I still have so many photos to share from Iceland, but while I’m showing off needle cases, I wanted to share these as well. The exhibit I visited at the Royal BC Museum in Victoria, BC was the first North American stop for “Vikings”, an exhibition produced by the Swedish History Museum, in partnership with the MuseumsPartner in Austria. The exhibit will be in Victoria until November 11, 2014, though I couldn’t find any information about where the exhibit would tour next (and my inquiries weren’t replied to). The exhibit includes nearly exclusively finds from Sweden (with one or two notable exceptions) and strives to give insight into Viking Age domestic life, death, craft, mythology, ship building, and trade, and the exhibit includes jewellery, swords, axes, and clothing along with other artifacts. In future, I’ll be tagging posts from this exhibit with “Vikings in BC” – so if you’re interested in the exhibit, follow that tag to see more. 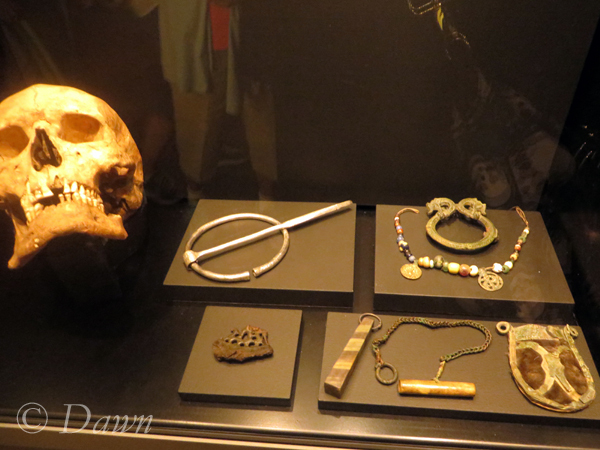 Display of grave goods from a commoner’s grave at the Royal BC Museum. These included a small brooch, a few beads, a needle case, and a small knife. The first photo is from a display of grave goods from a common woman’s grave. Unlike some of the other grave finds filled with necklaces, brooches, and lots of accessories, the common woman’s grave was shown in contrast, with only a small brooch, a few beads, a small knife, and a needle case. 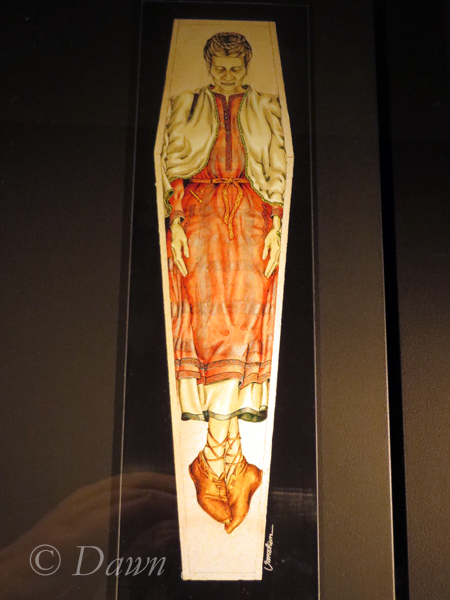 The grave was from Uppland, Sweden, and the small needle case (about two and a half inches long) is made of bronze. The coin was a Henry IV coin from between 1056-1105. The beads were made of glass, the penannular brooch (less than an inch across) is bronze, and the knife is iron and “organic material (silk)”. Another display was about personal adornment, and included a skull with filed teeth, a large brooch, a festoon, an ornate pin, a needle case, a whetstone, fire steel and a purse. The skull is from a male, and the display describes it as “in the upper jaw, horizontally filed furrows on the upper frontal part of the teeth crowns show that deliberate dental modifications were made”. The skull was found at a grave site in Slite, Othem, Gotland, Sweden. The necklace is a copy, made of glass and bronze. 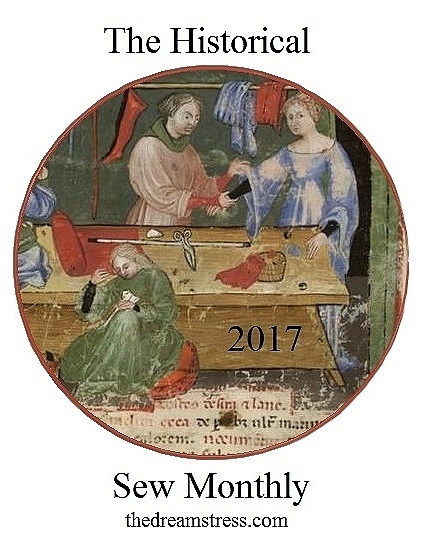 Some of the beads are authentic while others are reproductions as are the pendants. Both of the pendant copies are bronze and are based on a grave find from Uppland, Sweden. One of the originals depicts a sheaf or tree-like figure, while the other is an animal or mythological creature. The whetstone is made of “stone and shale” according to the exhibit display, and is a grave find from Uppland, Sweden. 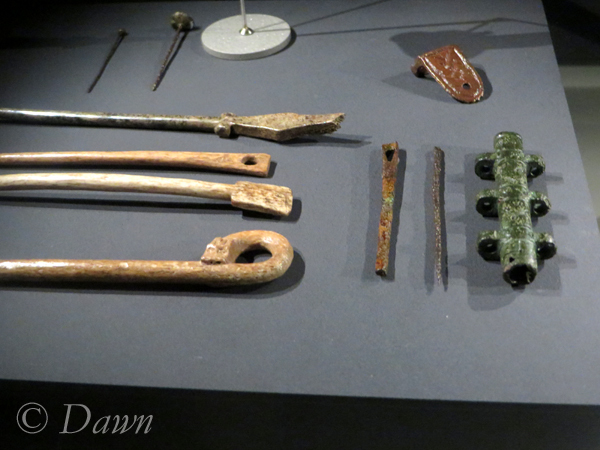 The fire steel is iron and bronze and was a grave find from Uppland, Sweden. The display describes the find as “the fire steel has an openwork bronze casting that depicts equestrian figures”. The elaborate penannular brooch is bronze and iron, the ends are shaped like animal heads, and it too was found in Uppland, Sweden. The large penannular brooch is silver, was from a hoard find in Gotland, Sweden, and it has “punch-ornamentation and trumpet shaped end-knobs”. The belt pouch is partially reconstructed, and in it’s displayed state is bronze, fur, and paper. It was from a grave find in Uppland, Sweden, and “the bronze mountings of a belt pouch are attached to paper fastened onto squirrel fur”. 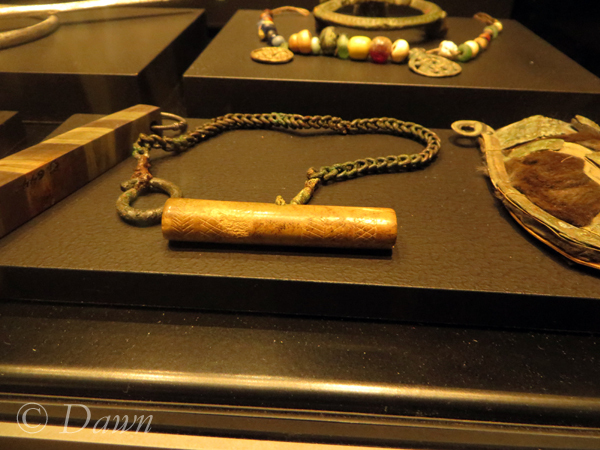 Viking personal adornment display at the Royal BC Museum – close up of the needle case with the festoon in the background. The needle case from this display is made of bone and bronze. The display said that it was a grave find from Oland, Sweden, and says “needle cases were used to hold and protect the needles”. 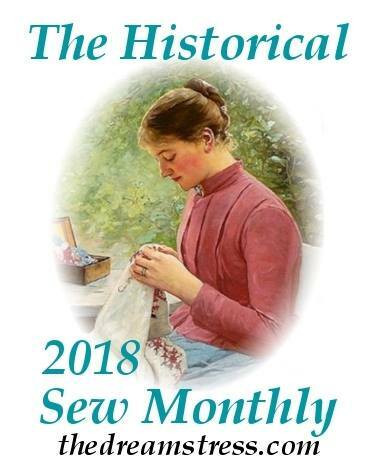 There are a number of designs scratched into the bone – what looks a LOT like double herringbone embroidery stitches/long-arm cross-stitch, and another that looks a lot like a feather stitch! Viking personal adornment display at the Royal BC Museum – close up of the needle case showing the decoration of the case and the chain it hung from. 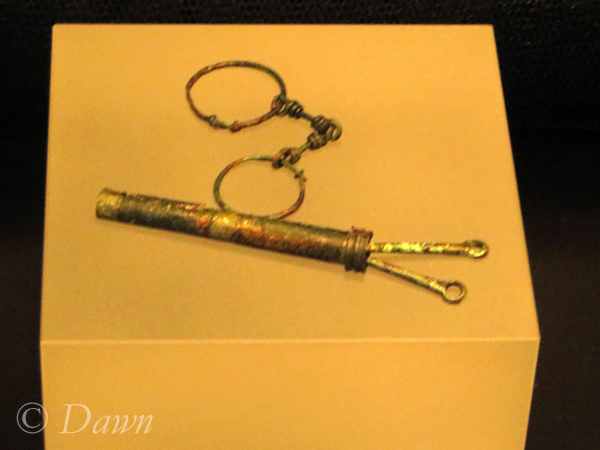 The needle case is made of bronze and is from a grave find in Gotland, Sweden. 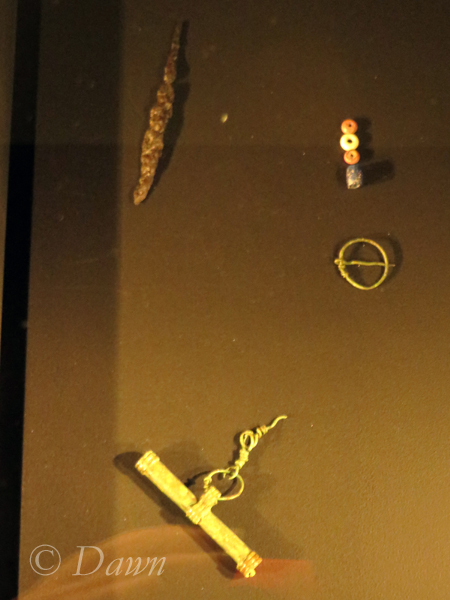 The display describes the case as “hung from the tool brooch on women’s clothing”. It doesn’t describe what the rings are – but they aren’t attached to the needle case. 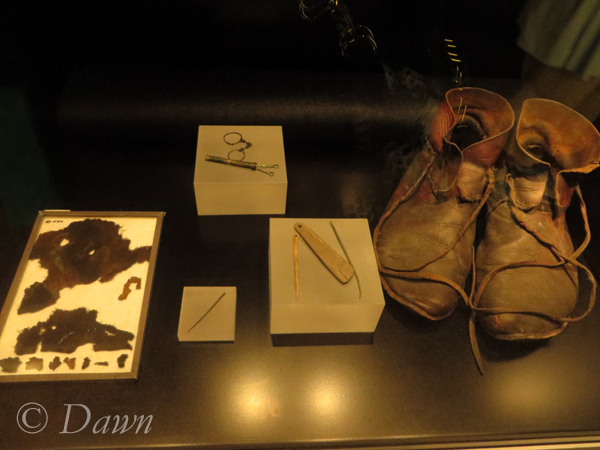 Viking ‘inside the home’ display at the Royal BC Museum – including a textile fragment, a pair of shoes, needles, a whetstone, and a needle case. The display “inside the home” included some textile fragments, needles, a whetstone, a pair of shoes, and the needle case. The shoes are leather reconstructions, and the display says “shoe designs followed the styles of the time and varied greatly in both quality and design.” The description doesn’t indicate where the originals were found. 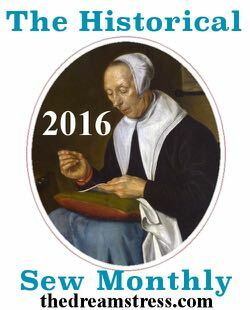 The textile fragments are wool, though there aren’t any notes about the weave or speculation of the kind of garment they’re from. The pendant whetstone is made of slate. There’s also a needle from this grave find made of either bone or antler. The needles are bronze – they appear to look like a ring on a tapered pin, rather than a tapered pin with a slit cut into it for the thread/yarn like what I’m more used to. This entry was posted in Museum exhibits, Viking accessories and tagged Iceland, Iceland National Museum, needle case, Saga Museum, travel, Viking, Vikings in BC.